HMS Queen Elizabeth overlooking the German surrender. Three Old Dragons had the good fortune to witness the events of this historic day: Commander Geoffrey Freyberg (RN) on HMS Valiant, Lieut.-Commander Moray Wallace (RN) on HMS Relentless and Assistant Paymaster Percival Chapman (RN) on HMS Royal Sovereign. The picture above, kindly sent to us by Geoffrey Freyberg, shows Admiral Beatty’s ship, HMS Queen Elizabeth, watching over a German Konig class battleship (in the distance). “We glide past the heavily-fortified island of Inchcolm, the Oxcars, and Black Rock booms… past Burntisland Roads… and then out into the night towards May Island, that bleak and barren outpost of the Forth, some 30 miles from Rosyth. Clear of the outer gate we get out our Para-vanes, one of the three great inventions of the war at sea (the depth-charge and the hydrophone being the other two). The Para-vane looks like a short torpedo with wings, it is towed from the stern and cuts moored mines adrift as neatly as a slicing machine cuts rashers of bacon. “Orders were given by the C-in-C that the German ensigns were to be hauled down at sunset this evening and were not to be hoisted again – in other words, sunset marked the virtual chucking up of the sponge. 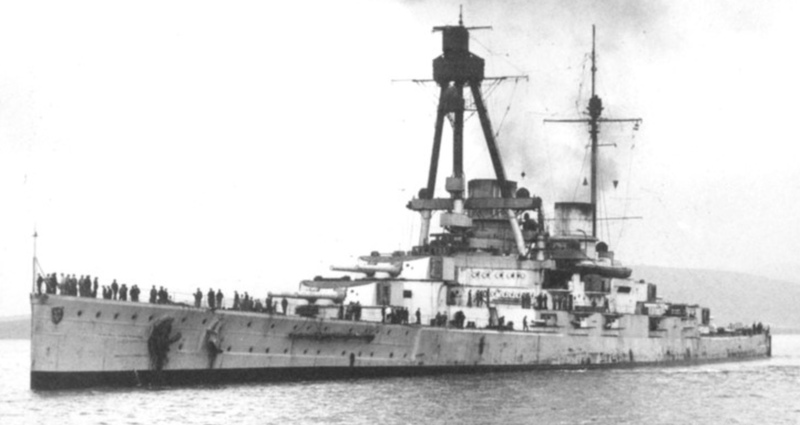 As I recall, the ‘Derfflinger’ fought at the Battle of Jutland and was responsible for the demise of HMS Invincible and Charles Fisher.